I’m coming up on two years since I had a horrific bicycle accident and broke my femur. Though I told part of the story on this blog, I didn’t describe exactly how it happened. I was thinking of suing the motorist who caused the accident, and had a vague notion that anything I wrote about how it happened might give me trouble later, especially since I was so angry at the time. Now that it’s essentially too late to file a lawsuit, I’m (mostly) free to tell the rest of the story. 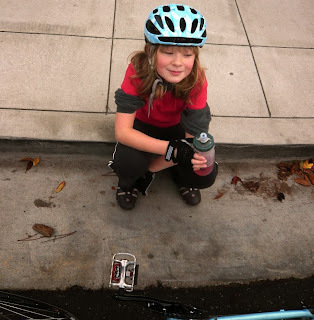 In this post I tell what happened; explain why I have decided not to pursue a lawsuit; and examine some inappropriate attitudes towards cyclists. In late November, 2011, I did an early morning bike ride with my daughter. Here’s a photo I snapped that morning during a rest stop. I was doing under 30 mph in the non-residential part, and then slowed down to around 20 when I got to the residential section. You can see an acceleration at around 1:21:45, which I reckon is after the stop sign after the intersection of Grizzly Peak Blvd with Golf Course Rd and Centennial Dr. (Yes, I stopped at the stop sign. My bike computer takes a sample of speed, altitude, heart rate, and other data every twenty seconds. My stop evidently took place between these data samples.) The fastest I went between this point and my crash was 23.5 mph, which is below the speed limit. You can see it’s not a very steep downhill. A car had been ahead of me and as it slowed down, I came up on it and also slowed down. It slowed down some more and suddenly veered to the right. What was this car doing? The driver hadn’t signaled so this veer took me by surprise. (I wasn’t that surprised, of course, because motorists often change direction without signaling.) I decided the driver must have pulled off to the side to let me by, as drivers sometimes do, so I kept going. Suddenly, the driver swerved to the left, across the road and directly in my path. The driver was headed for her driveway, on the left side of the road. I’ve looked at this driveway using Google Maps, and this was about a 135-degree hairpin turn. That’s why she’d swung right first—to give herself the full road for executing this tricky maneuver. It’s a pity it didn’t occur to her that there could be somebody behind her who might really benefit from a turn signal. You could say I had a very brief window in which to make a snap decision: do I just slam on the brakes, or slam on the brakes and try to steer around the back of the car so as to possibly miss it? But actually, it’s not really a choice: as any expert cyclist knows, it’s always better to avoid an impact with a car, even if this means sliding out and crashing on your side. I’ve heard guys recount a conscious decision to “lay her down” rather than hit a car, though I’m not sure I quite believe anybody has that much nerve. Suffice to say, when I slammed on the brakes while trying to steer to the right, I didn’t have enough traction to pull it off. I laid her down and missed the car, in the process avoiding a probable head injury and also sparing the driver from having to get involved. What’s that, you say? You say the driver was already involved? Yeah, no kidding! Somebody should have told her that! Because you know what she did? She completed her parking maneuver, shut off her engine, and—ignoring my blood-curdling screams that her neighbors heard, even a block away—went into her house and stayed there. I talked to the police officer at the scene, and pointed to the car that cut me off and the driveway it was parked in. Then I was carted off in the ambulance (you can read the rest of my saga here, here, and here). The officer subsequently interviewed the driver, and I’ve read the report, but each page is stamped with “Unlawful dissemination of this information is a misdemeanor.” I don’t want to take any risks, so I won’t tell you what’s in that report. But I’ll tell you what isn’t. For awhile after this crash I was intending to sue the driver, and I even retained a lawyer. But I didn’t actively pursue the matter—frankly, with physical therapy and just trying to heal up, I had bigger fish to fry—and when the months dragged on and I hadn’t heard anything from my lawyer, I didn’t pursue the matter. I have a few reasons for this. First, there’s the matter of how cyclists are generally viewed by the general public, and the even thornier matter of how I might be viewed when the insurance company’s defense trots out a freelance article I wrote called “Five Seconds on a Mountain Pass – On Being a Velocity Addict.” That doesn’t look good, especially when cyclists in general are widely believed to be reckless speed demons who deserve what they get. With this in mind, I considered that the lack of response from my lawyer may have indicated second thoughts on his part. Then, there’s the matter of my mental and emotional health. I was so angry, for so long after that crash, that I had trouble sleeping. It took great force of will to not dwell on the driver’s behavior every night when I lay in bed trying to fall asleep through all that pain. To open up a new can of worms, that would rekindle that rage, was not a pleasant prospect. Finally, there’s something my lawyer said: that in these “he-said, she-said” cases, often the outcome boils down to how the jury feels about the parties involved. If they like you, he said, of course that’s not a bad thing. But if they hate the defendant, that’s when you can get a very favorable result. I’ve let on in this post that this driver was female (simply because I can’t be bothered to play the non-specific-pronoun game); she also had two other traits that are often connoted, unfairly, with being a bad driver. I wouldn’t want to win big just because a jury let itself be influenced by (possibly subconscious) stereotypes. And oddly enough, since I know this driver to be a complete coward, I figured putting her on the stand would cause her a lot of pain. And though part of me would welcome such revenge, the bigger part of me doesn’t like to cause pain, especially when I don’t know the circumstances of that person’s life. There’s a good chance that if you’re reading this blog you’re a cyclist, and thus you understand things about our sport that the general populace doesn’t. I have a hunch that if you’ve ridden with me, you didn’t read this report and think, “Well, it’s clear that a foolish daredevil like this—author of 'Velocity Addict,' for crissakes—got what he had comin’!” But in case you really do think this is my fault, and that such accidents are often, generally, or always the cyclist’s fault, or in case you’d like to try to educate a benighted motorist of your acquaintance by forwarding this, I’m going to explore the idea that I could be innocent in this even though I like to ride my bike fast. There are certainly cases where it would be hard to defend a cyclist, like the case of the guy who took a curve too wide, crashed into a car, and was killed while trying to set a new record descending South Park Drive. There, the reckless behavior directly led to his death. But there’s a temptation to connote the willingness to go fast—as in over 40 mph—with an overall risk profile that you label “daredevil” and which puts the blame on the cyclist whenever he gets into an accident. When we evaluate risk, there’s an impulse to extrapolate from the specific to the general. For example, if your brother-in-law is a gambling addict, you’re probably not going to loan him money. After all, you can guess what will happen to it. This is a highly reasonable judgment, I think, but mainly because money is fungible. Loaning money to a gambler is just like gambling yourself. But would you also naturally assume that a gambling addict is a reckless driver? Well, possibly. But what about other people who take risks on a regular basis? Being a garbage man is a very dangerous profession. Would you automatically assume that if a garbage man gets in a traffic accident that it’s his fault, because he tolerates a high level of risk in his daily life? Of course not. I do think it’s dangerous for a cyclist, even an expert cyclist, to descend the residential section of northbound Grizzly Peak Blvd. But I don’t think it’s dangerous for an expert cyclist to hit 40 mph descending Claremont Ave. Should this attitude get me branded as a daredevil, such that it’s my fault when I get hurt doing something the layman may think is reasonable? In thirty years of competitive cycling, I’ve had three bad accidents. Once, I crashed mountain biking and it was totally my fault and I’ll own that. (In fact, I have, right here.) Due to that crash I needed stitches. With my other two bad accidents, a car was involved. Once, I was riding in a business district when a driver failed to see me and turned right into me. I was going under 20 mph, in the bike lane, wearing a bright orange jersey in broad daylight. I suffered a separated shoulder and a cracked elbow. (The driver accepted responsibility and his insurance company took care of me.) The other time is what you just read about: I was doing under 25 mph in a residential area. Broken femur. The total tally of my serious injuries from crashes on high-speed descents? Zero. I used to work in risk assessment. When professionals evaluate risk and design safeguards, they do so in terms of two main factors: severity and likelihood. When we consider the severity of crashing at 40 mph on a bicycle, with just eighth-inch-thick Lycra and a Styrofoam helmet protecting us, we get a visceral sense that this is really, really bad. And yeah, it would be. But it can be less bad than a lower-speed collision with a car. Meanwhile, setting severity aside for a moment, the likelihood of an expert cyclist crashing at 40 by himself on a mountain road is way, way lower than the likelihood of a bike commuter getting creamed by a car in Anytown, USA. I don’t have a mountain of statistics at hand to support this but I’ll bet I could assemble one. So is the “daredevil” road racing cyclist really more to blame, when he does get taken out by a car, than the responsible commuter? Decide that for yourself, but I’ll guarantee you two things. One, the racing cyclist who can handle a bike at 40 mph will be better equipped for evasive maneuvers at 20 mph and be much less likely to panic. And two, the racing cyclist who can handle a bike at 40 will better appreciate risk, and pay a hell of a lot more attention, than most motorists in this country. Of course, a jury in a bike accident case may not differentiate between a bike racer and a casual bike commuter. There’s this widespread idea among Americans—that is, among American motorists, because virtually all adult Americans are both—that cycling is inherently dangerous, and that cyclists who get hurt have only themselves to blame. But my experience tells me that opinion is pretty absurd. The most dangerous thing about cycling is being around careless motorists! When’s the last time you saw a motorist neglect to use his turn signal? Earlier today? I thought so. In my experience, a typical motorist seems to consider it none of your business if he chooses to use his turn signal or not. If a motorist does deign to use his signal, it’s usually just because he knows he’s supposed to. In my experience, cyclists almost always signal their turns, because they want the cars to know what they’re doing. They don’t want to get run over. Here’s something to consider: between in-car accelerometers, wireless communications, and GPS, the highway patrol could develop the capability to detect if a car turns without its turn signal being activated. Imagine if this technology was used to police the turn-signal law. It would be kind of like those cameras on traffic signals that automatically ticket you for running the red. You think if it were put to a vote, people would choose this kind of new, high-tech enforcement? And do you think they’d also warm to the idea of network connected cameras on highways automatically busting you for speeding? Of course not. The spotty enforcement of traffic laws is like a big game, and motorists like it that way. In other words, they consider it their God-given right to flout traffic laws if they feel like taking the (relatively small) risk of getting caught. According to a recent “New Yorker” article, “Of the ten million [car] accidents that Americans get in every year, nine and a half million are their own damn fault.” So why are cyclists considered the big risk takers? Well, probably it’s because cars do such a good job of protecting us most of the time. (That said, car crashes have been the leading cause of accidental death for most of the last thirty years.) Careless motorists get in an awful lot of minor fender-benders that don’t do much to make driving seem dangerous. The fact is, being in a car just doesn’t seem that dangerous, and that’s precisely what makes cars so dangerous to the non-armored among us. Drivers feel so safe, ensconced in these giant vehicles that are loaded with safety features, that they discount the overall risk that driving presents. What is to be done? Nothing, of course. There’s no solution, because motorists so hugely outnumber cyclists in this country. Majority opinion seldom shines brightly on minorities. Though we can’t snap our fingers and make American drivers more careful, there are a couple of things I’d like to ask motorists to do. Number one: when you’re driving in your car, enjoying a little “me” time, your radio tuned to your favorite station, maybe driving down a remote road you know like the back of your hand, try to remember that you’re still in a public space, and try to be aware of who else is on the road, not just right in front of you but behind you. And two: when you do screw up and either hit a cyclist or cause him to crash, try to remember that George Carlin was being facetious. Take responsibility. Do not leave that poor maimed cyclist lying there in the road. If you fess up, your insurance rates might go up, but the law will go easy on you, the motorist. The law always does, where we daredevil cyclists are concerned. I am glad you got over it and let it go, but now that I read it, I am not over it. The behavior of the driver was simply appalling. The cop’s handing was also maddening. Indeed, what is to be done?